This 14,000-BTU portable air conditioner is ideal for spot cooling larger rooms up to 500 square feet. With three cool settings, three fan settings, a 24-hour on/off timer and dehumidify mode, this single-hose model is equipped to meet your interior climate needs. Cools rooms 500-700 sq. 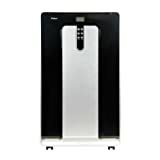 ft.
Haier HPN14XCM Portable Air Conditioner, 14000-BTU out of 5 based on ratings.